Mega Bog opens for Destroyer this Saturday at The Waiting Room. Photo by Vanessa Haddad. Mega Bog is the project of Seattle native now Brookynite Erin Birgy, who has been making her unique potion of jazz-infused art rock for eight years. 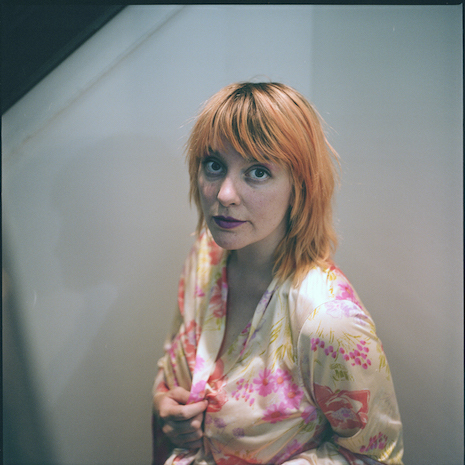 Her latest album, Happy Together (2017, Nicey), runs and wobbles between free-form loveliness and dizzy indie rock, giddily capturing an artist in motion with a breathy voice that evokes memories of Nico. Her band has included members of iji, Hand Habits and Big Thief’s James Krivchenia (who also mixed and mastered her new record). Mega Bog’s Erin Birgy: Definitely don’t have a favorite, but Diamond Dogs is almost always on standby. It’s what I use to practice vocals. Deeply inspiring. (Bandmate) Zach (Burba) and I are trying to pick a least favorite song, but it’s hard! We thought of a time our friend, Joel, who helps with all the album art, was playing something by a Magnetic Zero band. I enjoy the responsibility of learning how to take care of others, my family, and act as an ambassador for this weird music world. Peanut butter in the car. Having to compromise with other peoples cleanliness standards, or lack of. A show at Bard College eight years ago. It was a terrible tour, with an abusive guy in the band we were touring with, and I was at the end of my rope dealing with their creepiness and anger. It was freezing, everyone in the band was fighting, and I cut my hand on a borrowed guitar after mine broke, and just laid my head down on the concrete floor and started crying. I took it all out on Zach while we played, which made it doubly worse. He left the “stage” early and people were backed up against the garage door, just scared and annoyed. In some moments, it seems like it. I do a lot of strange gigs, but kind of a $200 an hour minimum, if it’s not music. I don’t see myself as a professional. Or a musician. I do see myself as a citizen scientist. I could take that more seriously. I’ve never heard a story about Omaha, Nebraska. Tonight Son, Ambulance returns to the stage, this time as part of Pageturners’ Winter Concert Series. The band just played a few weeks ago at O’Leaver’s, but no two Son, Ambulance sets are ever alike nor is the line-up from show to show. Expect some surprises, and a large crowd. Sean Pratt & the Sweats open at 9 p.m. Admission is, as always, free.